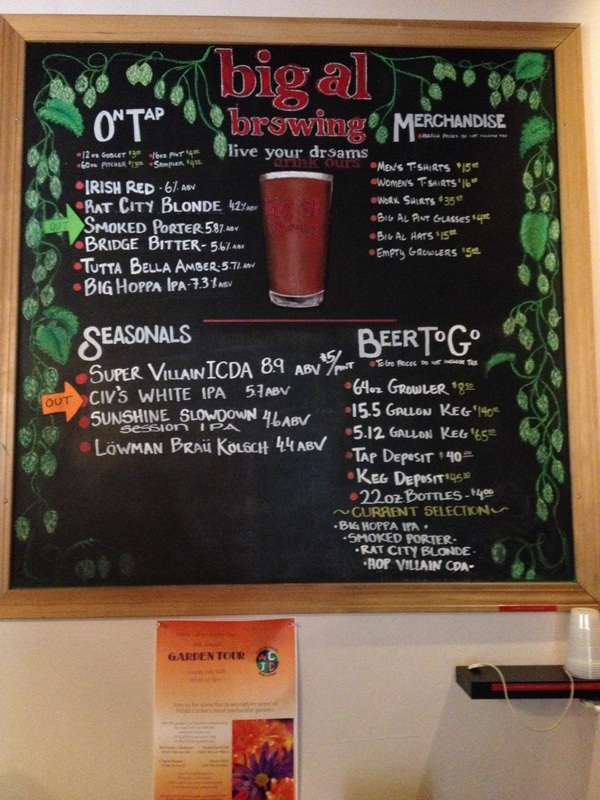 Updated Sept 17: An Adventure to Big Al Brewing and Super Deli Mart. Now with Beveridge Place Pub! 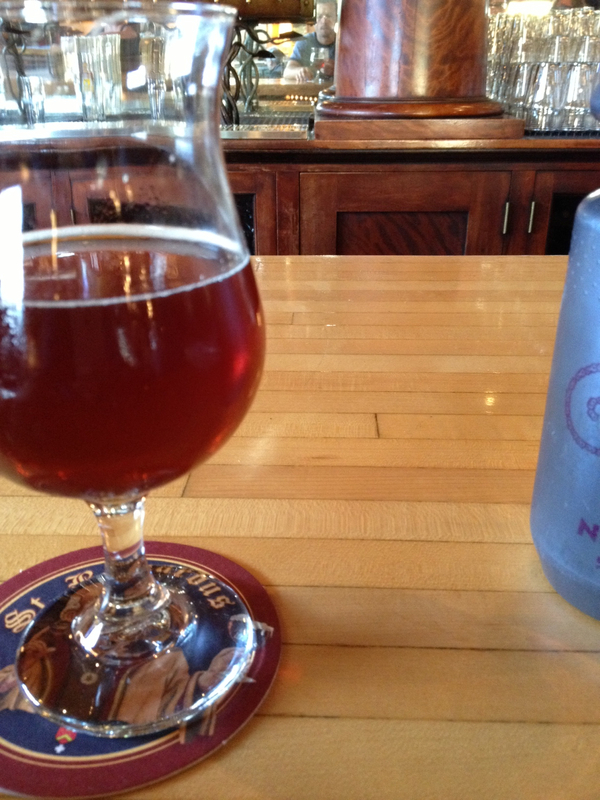 Join me for a spin on over to White Center’s Big Al Brewing and the nearby Super Deli Mart. 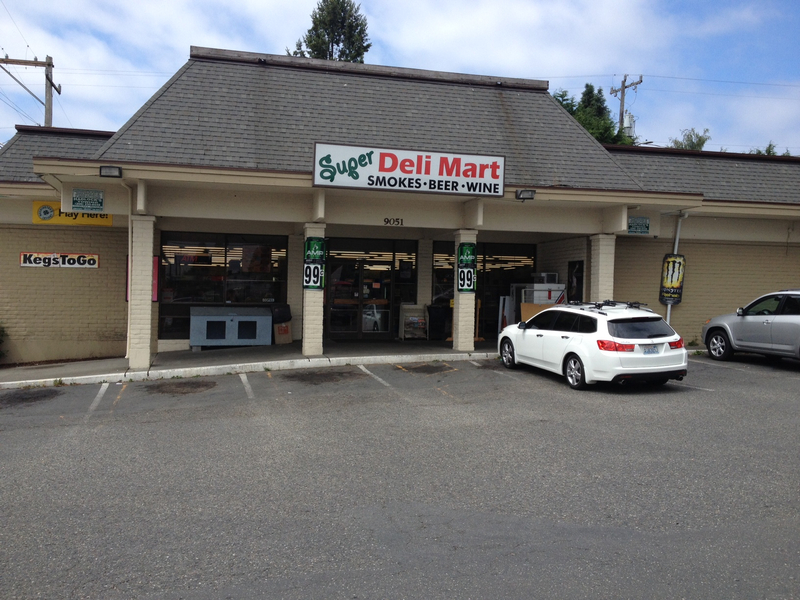 Super Deli Mart (9051 35th Ave SW) is that other quickie mart in town that pours craft beer. Repeat: pours craft beer. Gimme a lottery ticket, a pack of smokes, and oh, a pint. I had visited Big Al (9832 14th Ave. SW) a couple times using a treacherous route that had me on a highway where I’m not sure bikes are even allowed. 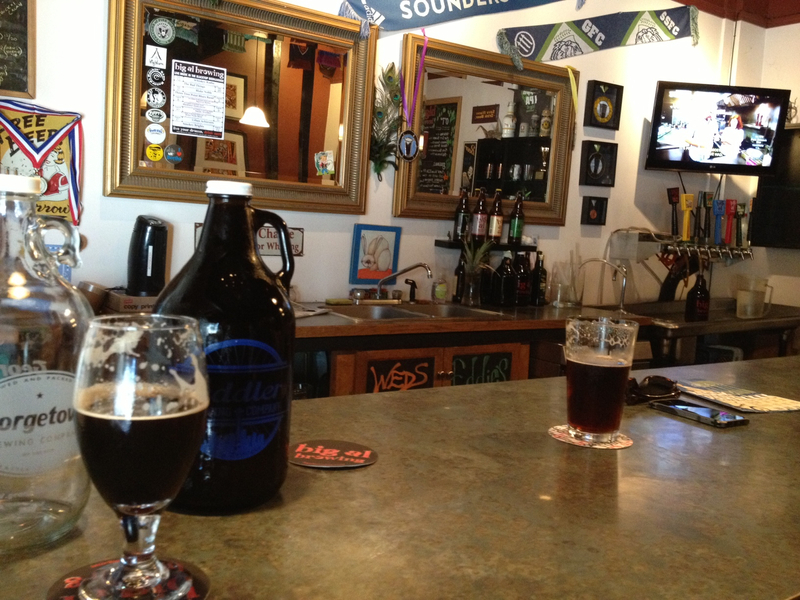 Then one day I was at Schooner Exact Brewing talking with Heather, the co-owner, and told her my plan to visit Big Al. She called her husband Matt, the co-owner and head brewer out from his duties and he drew me up a little map of a quite decent route to Big Al. On the map I’ll include in tonight’s post you see that route. Also found on the map you’ll find the route over to Super Deli Mart and the route back to Downtown. Next I will describe the route and my beer experiences there. The route from downtown to West Seattle is described in detail in my post regarding The Beer Junction. Here I will just say take the Elliott Bay Trail (which is still altered due to the Alaskan Way Viaduct undergrounding project) south to Spokane Street where you turn right and follow the trail toward the lower level bridge which of course is awesome in its separated protectedness. The difference in this route is that you leave the trail just a bit sooner and veer left onto the slightly less wide sidewalk that heads up to where you pass a rather distinctive looking sign that welcomes you to the Pigeon Point neighborhood. This sidewalk leads you to 22nd Ave. Here you head south for a short distance until you reach Andover St. where you turn left and go one street over to 21st Ave. and continue south. Why cut over one street here from 22nd to 21st? In order to avoid my mistake of thinking I could wait and cut over where 22nd ends. Doing so resulted in me rolling onto what looked like a pretty private road if not a driveway, then discovering as the road ended that a sidewalk did indeed go left, connecting me over to 21st, it’s just that you must ascend a great big (and newly-constructed and nice) staircase to get there. I picked up my bike and carried it on up. 21st Ave. here has speed humps. I have read something about speed humps in this area of West Seattle and how they were put in place due to the efforts of cycling and non-motorized advocacy groups. I also read about how the man who spearheaded this project which helps, as I can attest, cyclists as well as the residents of this area, was maliciously hit by a woman driving a car. Seems she was allegedly incensed by him getting in her way, then intentionally hit him, knocking him off his bike. Fortunately he was okay enough to continue on with his day and let the public know about it via Seattle Bike Blog. On my most recent trip through here I saw first hand how these speed humps slow down car traffic yet don’t slow down bike traffic much at all. In other words, it helps force drivers to obey the speed limit. Nice. But how sad that we must physically force drivers to do the right thing. Continue south about 2.5 miles on this nice relaxing, flat stretch until the road makes a left at Myrtle St. Take Myrtle to 16th Ave. where you turn right. You are greeted with bike lanes here on 16th which at a certain point diminish to sharrows symbols painted in the main traffic lane. 16th, while residential, is pretty busy and has fast-moving traffic. As you approach Henderson St. the sharrows disappear and the environment starts to change from residential to a mix of businesses and homes. The sharrows pick back up in a bit. You then get into White Center and what appears to be the main drag or downtown core. It is apparent that the place has received a refreshing recently, but this area is still not the nicest. At 98th turn left. Continue to 14th and turn right. Ahead and on the left is the two story, industrial metal building that houses Big Al Brewing! Your eye will be caught by the two semi-circular, red awnings in the parking lot that cover some outdoor seating. Big Al Brewing is apparently proud of its White Center roots. I don’t know anything about White Center other than it is what I would describe as, well let’s say not the safest neighborhood. Yet right there in the middle of it sits this craft brewery that boasts “born and bred in White Center.” There’s something about that that I admire. Roll up to Big Al and you find that the metal building and its lot are enclosed in a chainlink fence. Enter the lot and you see the outdoor seating setup on the asphalt. Nice that they have the coverings to keep the sun and rain off you. There is bike parking in the corner up near the building. 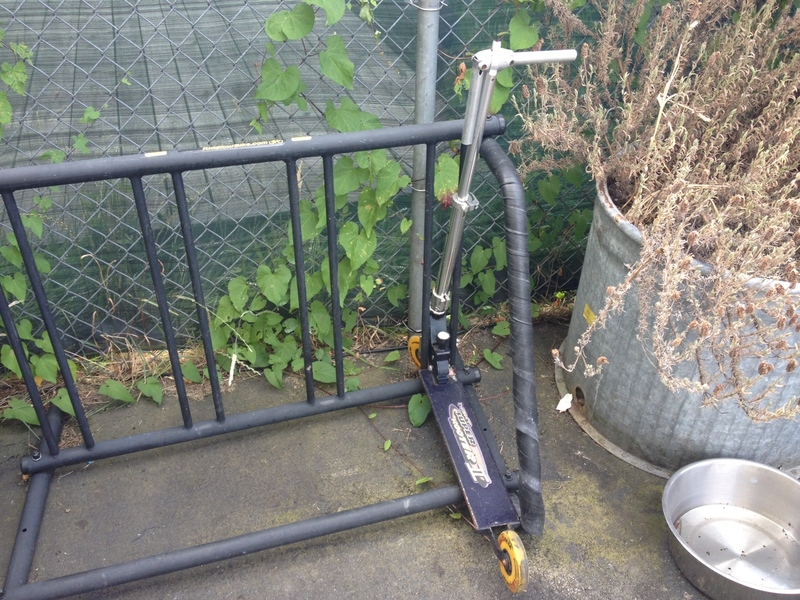 I wonder if someone rides their scooter to the brewery. Notice also the dog water bowl. Always nice to see. 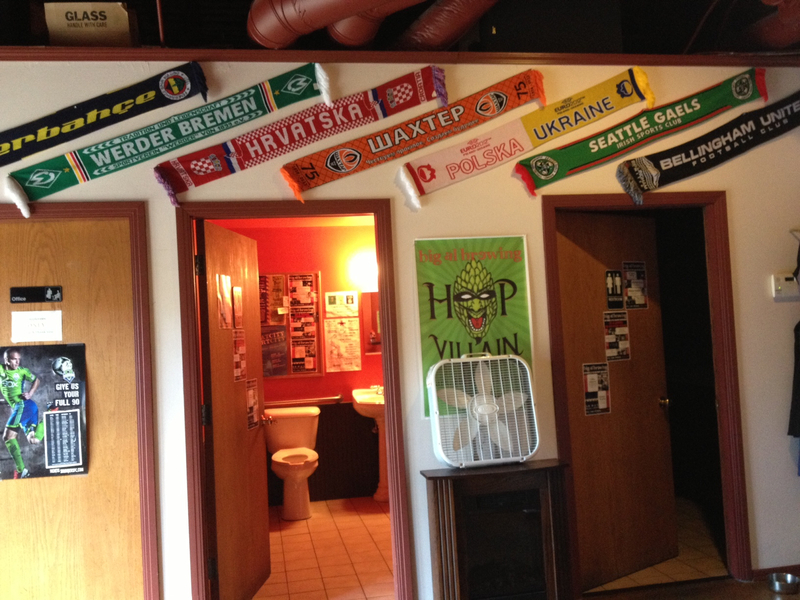 Enter and find a pretty nice taproom environment. 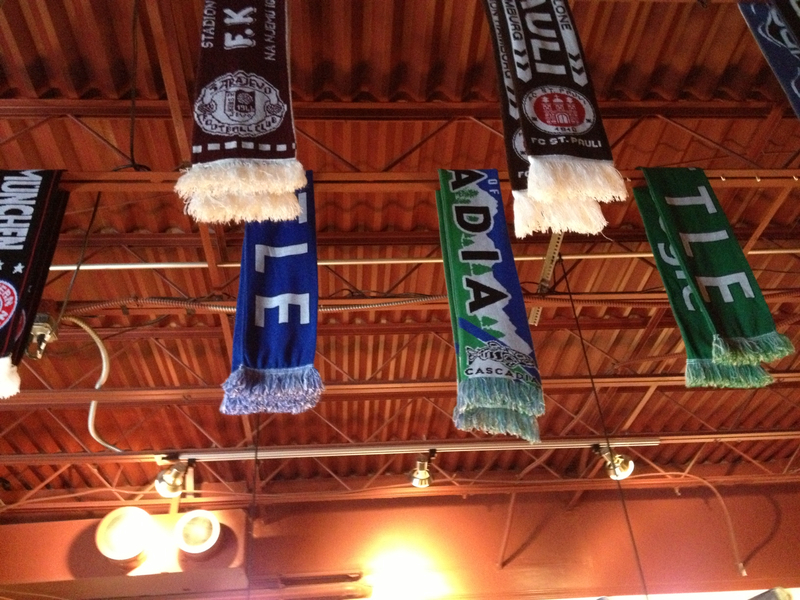 There is a soccer scarf thing going on in there. I know Big Al is a supporter of the Seattle Sounders soccer team. In fact they have a beer named Brougham Bitter which refers to, I’m not sure exactly, but I think the end of the stadium that is toward Royal Brougham Way. I like the “Hop Villain” artwork. I had been to Big Al’s a small number of times before and I recall always getting decent service. Today I got good service from a charismatic female beertender. After taking a seat at the bar I began to scan for a beer menu on the wall. 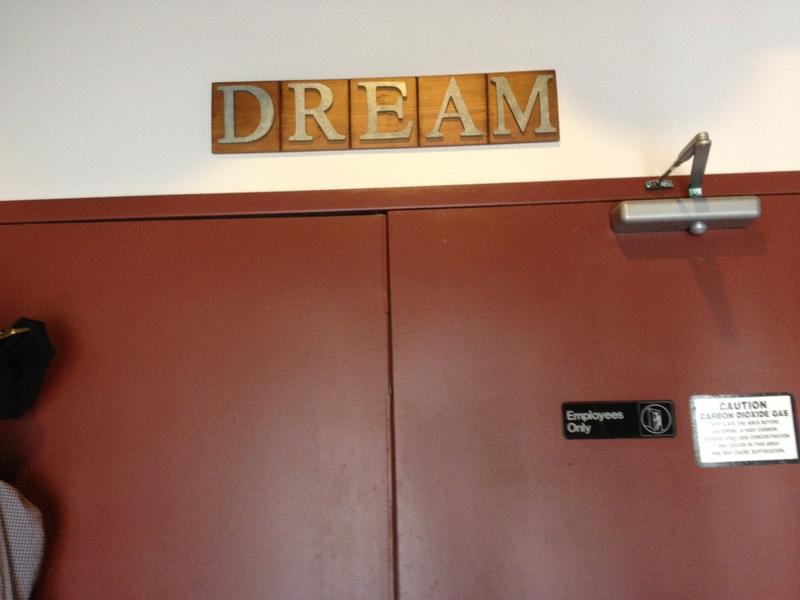 My eye was pleased by their attractive, informative chalkboard on the wall to the right. It was a pleasant experience sitting at the bar during this not very busy time at the taproom. My ride there had not been that long or arduous, but still long enough to provide a sense of accomplishment. I first had the Big Hoppa IPA and was quite pleased with it. A respectable ABV for an IPA, and a very good flavor. Hoppy enough, but with an unusual sweetness. A “round” flavor as I refer to it (as opposed to sharp). Given how good this beer was and their good growler fill prices I knew I would be filling one of the two jugs I brought with me that day. The second growler I had onboard that day was from Georgetown Brewing. I deliberated for a bit on whether to take it over to Georgetown to get a fill or whether to get it filled here. I called Georgetown to see if they had raised their prices again (which they had not, and in fairness, have not raised them as fast as some other places) but decided to let Big Al Brewing provide both growler fills for me. I have gotten unfriendly service at Georgetown, and I have gotten good service at Big Al. Decision made. 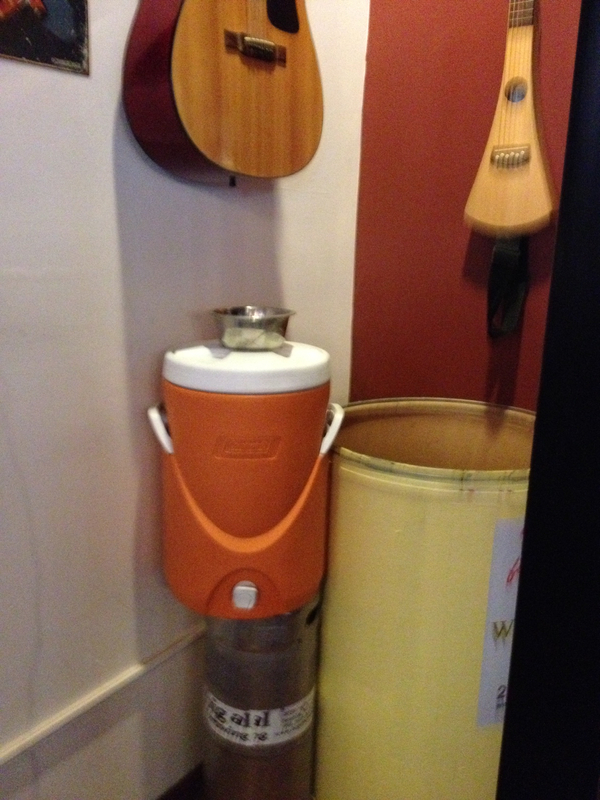 Another big plus I found at Big Al today was the presence of a water cooler. As you know, I work hard to stay hydrated – all the time, not just while I’m imbibing. Especially after sweaty bike rides though, it is impossible to get a beertender to supply me with as much water as I need. 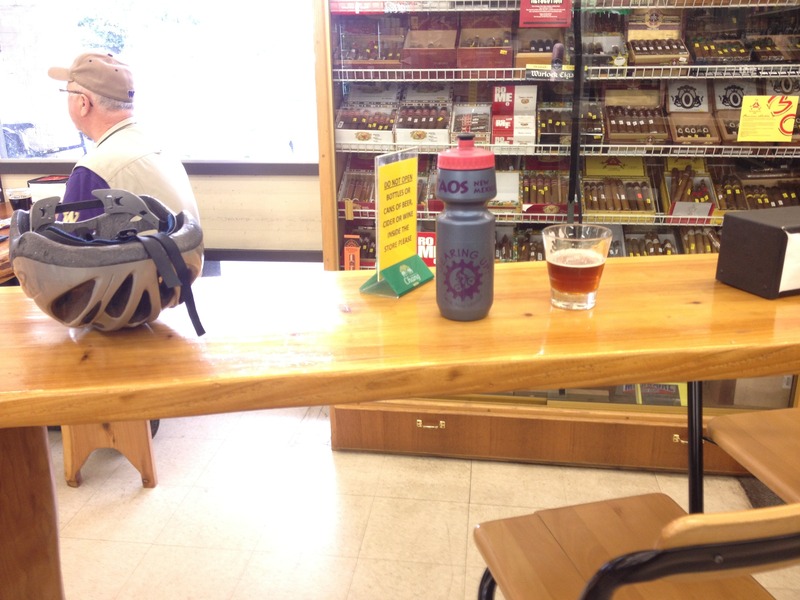 This is why I always bring either my bike bottle or my Nalgene-type bottle into establishments with me. Being able to serve yourself as much water as you need is huge. The dog bowl on top provides an especially appetizing appeal. 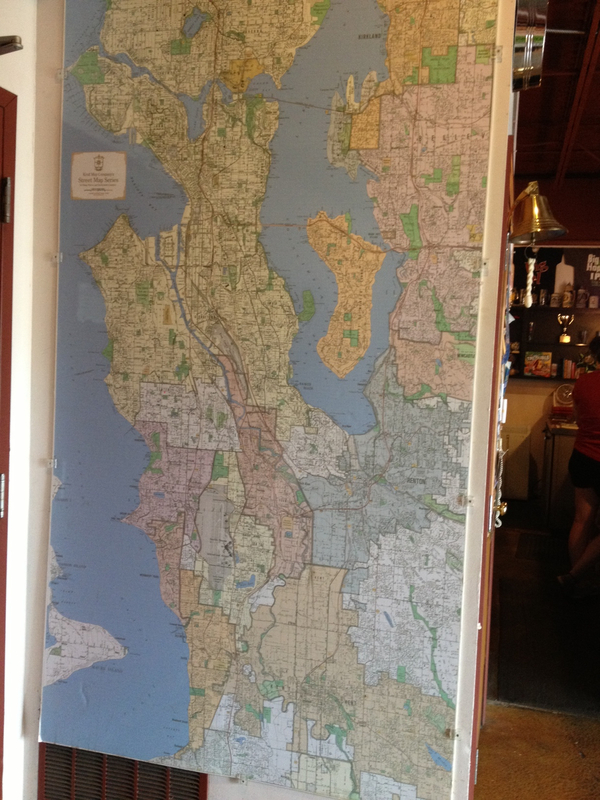 Around the corner to the left of the bar and next to the double doors that lead to the brewing area is a large wall-mounted map. This map served as more than artwork for me one day a few years ago when I sought to go from White Center to South Park to try to find Baron Brewing. The beertender showed me on the map the way to go. Actually on this most recent visit I also got directions with the aid of this map as I was considering riding over to Georgetown. Thanks, big old map. Your’e not just another pretty map. 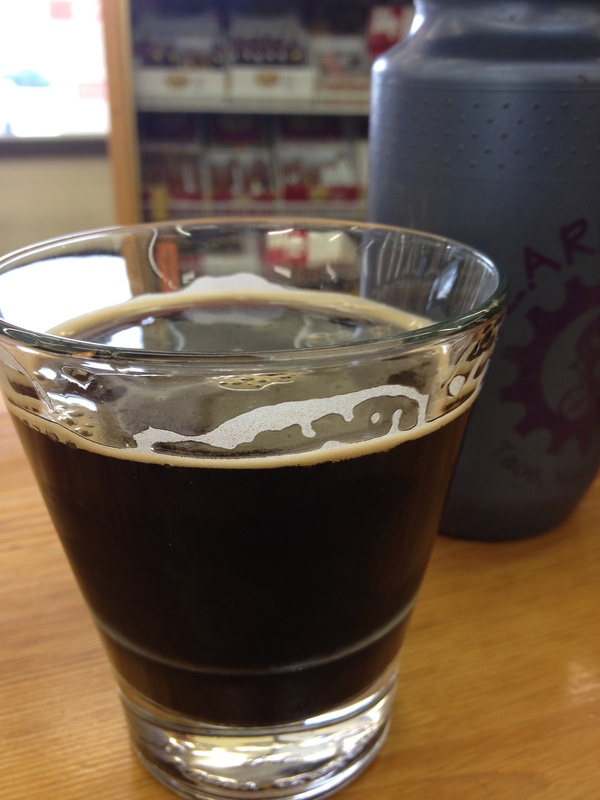 My next beer was another winner: Super Villain ICDA (Imperian Cascadian Dark Ale). For those loyal readers not familiar with beers of the Pacific Northwest: Cascadian Dark Ale is a Black IPA. Super Villain comes in at 8.9% ABV and was a nicely balanced, lovely beer. After a fine experience at Big Al, I took my two full growlers, loaded up and set off for the next stop just a couple miles away: Super Deli Mart. Exit Big Al and heading to the right (north) on 14th Ave. At the next street (98th St.) turn left. Take this stretch of shouldered road until it comes to a T at 26th Ave where you make a right onto this road with wide shoulder in which cars park at least part of the time. Soon you turn left on busy Roxbury and travel about 1/2 a mile. There are no bike facilities on this stretch and you’re not in very friendly territory, so be on alert and you may want to be in highly visible clothing. Next, when you reach 35th Ave., turn right and take heart. You’re only some 1500 ft. from Super Deli Mart which will be on your left across the intersection at Barton St. 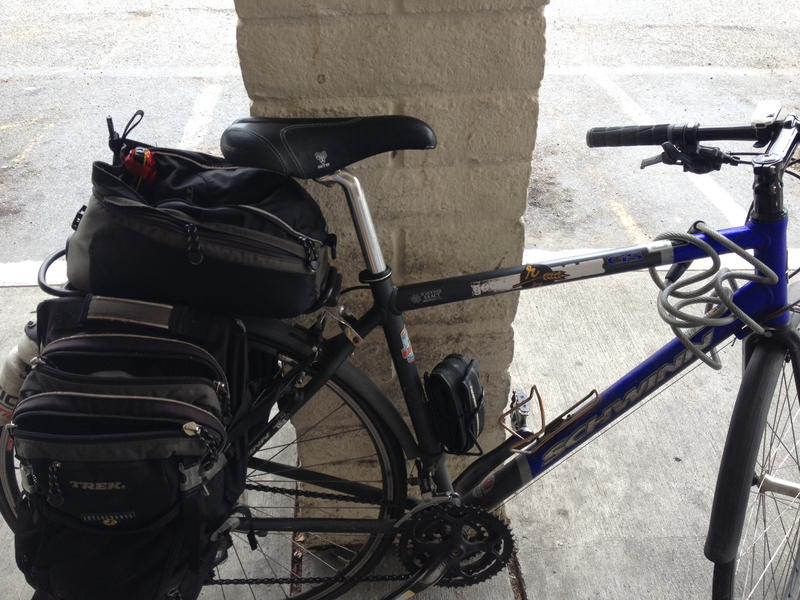 There is no viable place to lock up a bike here other than to the block pillars in front – that is if you use a cable lock. The cable is barely long enough. But still, it’s the best parking spot in the place. 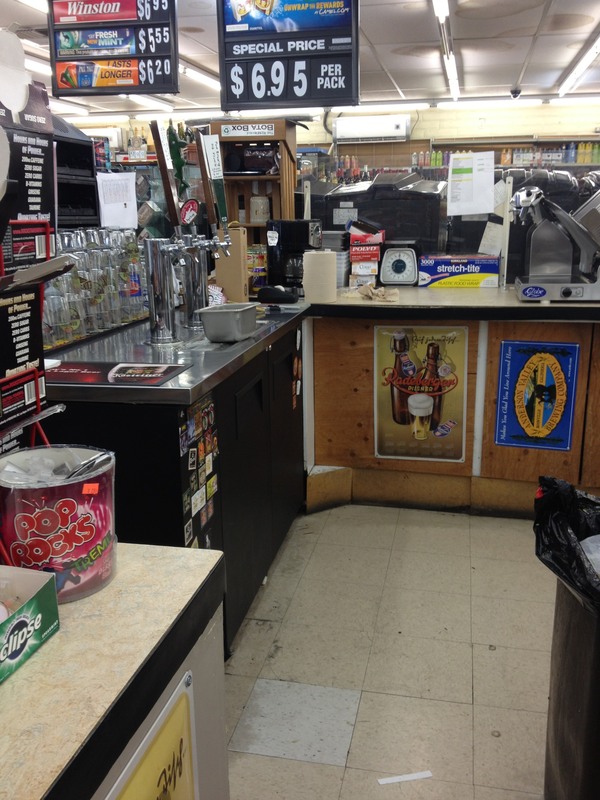 Enter and see a pretty typical quickie mart. 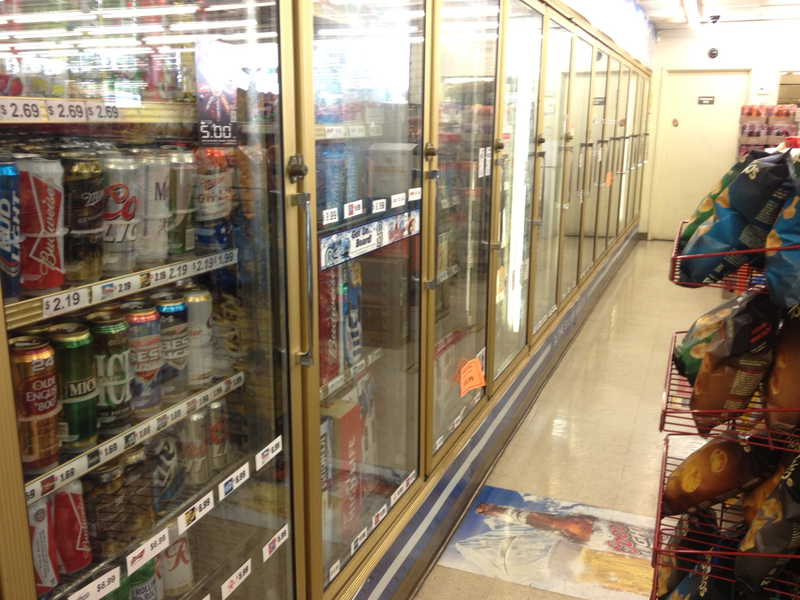 The right half of the store is mostly devoted to beer though. There are stacks of cardboard boxes containing craft beer dispersed through the store. There are displays of a wide variety of micro brews from the region and beyond. The cheap end of the coolers. 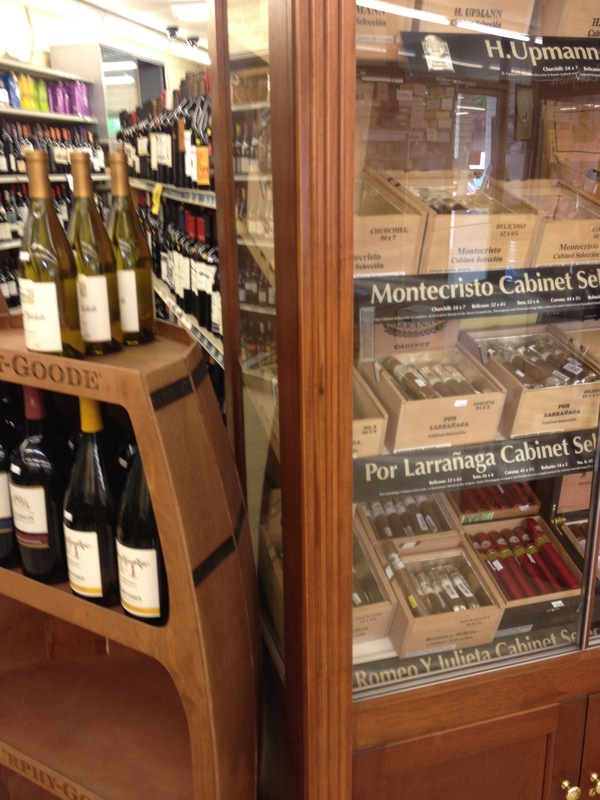 The left half holds the wine and something else particular to this place: a pretty nice array of cigars or something like them. Stuff in which I’m somewhat less interested, and not at all interested (left to right). Step up to the counter and, if you look closely, you see the tap handles – about five of them if memory serves. It’s not readily apparent what is on tap. Next to the meat slicer, find some taps. Also see a part of the menu displaying the types of sandwiches they offer. I’ve heard good things about these sandwiches, and they’re not outrageously priced. I had to ask the person behind the counter (who happened to be the owner guy) what was on tap. I don’t know this guy’s name, nor have I ever had a conversation with him. It’s interesting to me that he happens to be Asian, just like Chuck from Chuck’s Hop Shop (see my post on that establishment). I have thought it would be interesting if these two guys would meet. This day, I ordered a Dogfish Head Aprihop which is about what it sounds like: a relatively hoppy beer with an appropriately proportioned flavor of apricots. 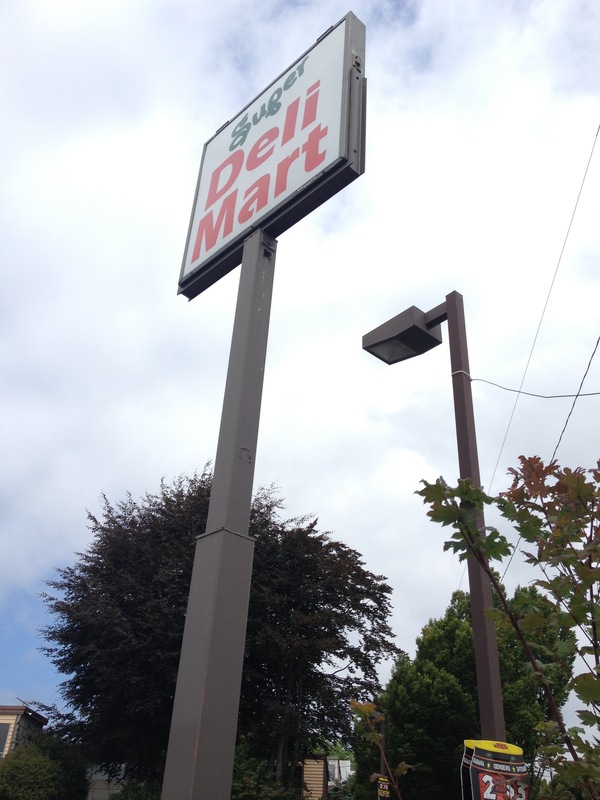 The pint didn’t cost much, which brings up an important point regarding Super Deli Mart. They charge very reasonable prices for their draft beer. An exception is apparently made for beers they consider (say it with me now) rare or hard to find. I believe the pint price was $3.50 or so for all of their beers except for the beer I got next: Port Brewing’s Old Viscosity, a very nice imperial stout out of California. The price for a pint of that on this particular day was, if I recall, $7. I recoiled at that, which is why I wound up first with the Aprihop. But as I thought about it, I decided to order a 1/2 pint of it (something I had confirmed that they offered – at 1/2 price I believe). Good stuff. And my trusty water bottle. Also good. Though probably not BPA free. After enjoying my beer, I mounted up and headed back using a route I knew would take me into the California Junction area of West Seattle. Or is is Alaska Junction? Seems I’ve already forgotten, as my mind, heart and body have checked out of Seattle. See my next post for more information on that. At any rate, exit Super Deli Mart and head left (north) on 35th. I always have walked my bike to the intersection and crossed on foot, as this road is far too busy and hectic for me to try to turn left out of the driveway. When you reach Thistle St., a stop light intersection, turn left. Take that hilly, sharrows-equipped road until you reach California Ave., where you turn right. A particularly significant climb awaits you on this stretch as you approach the business district of Alaska Junction. Hey, we can’t roll past this stretch without stopping in Beveridge Place Pub, can we? (Yes, that’s how it’s spelled). I won’t delve too deeply into Beveridge Place here, but I will say they are all about the beer and have a good selection. If I lived in the area, I would be a regular if I could stand the inconsistent service. Seems this is one of those places everybody loves, so the beertenders have leeway to act how they choose. On this particular visit, I had a very professional, nice male beertender. There is a bike rack in front. I normally consult their chalkboard menu, hanging high to the right of the bar, for the beers with the red dots next to them. 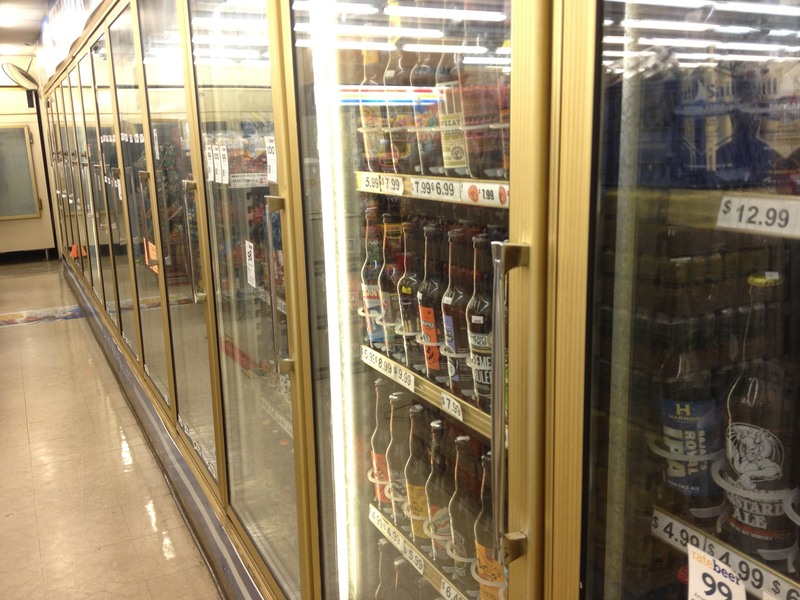 These are the least expensive brews. The green triangles, I think, mark the more expensive beers. Today, however, I chose to entertain thoughts of the green triangles. The beers I recall from this visit were from Almanac Brewing – a newcomer from California whose slogan is “farm to bottle.” Seems Beveridge Place had just had a brewer’s night with them and still had their beers on tap and nice flyers outlining Almanac’s beers. I tried a chocolate stout or porter, then I believe a barleywine or other strong brew. It’s a shame I don’t currently recall exactly which of Almanac’s beers this was, as I do remember it was noteworthy and I decided it was the best of that particular style that I had yet tried. If I remember which beer it was I’ll update you. This adventure took place several weeks ago and a lot has gone on since then. See my next post for more on that. Beveridge Place allows dogs and has a large adjacent room with at least one pool table and with darts. In the main room, by the way, are board games, books and several comfortable-looking seats/couches. 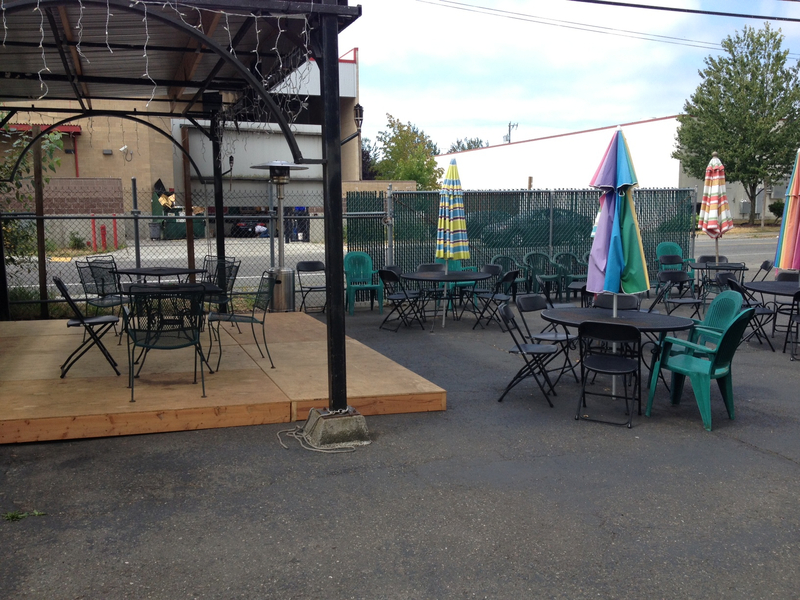 There is also an outdoor seating area. This is a pretty fun place. 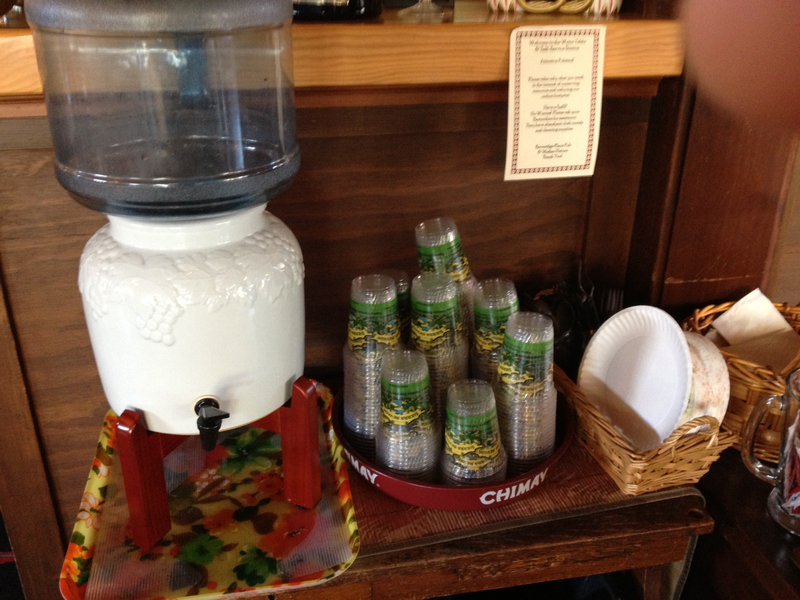 Always something that scores points with me is the presence of self-serve water. 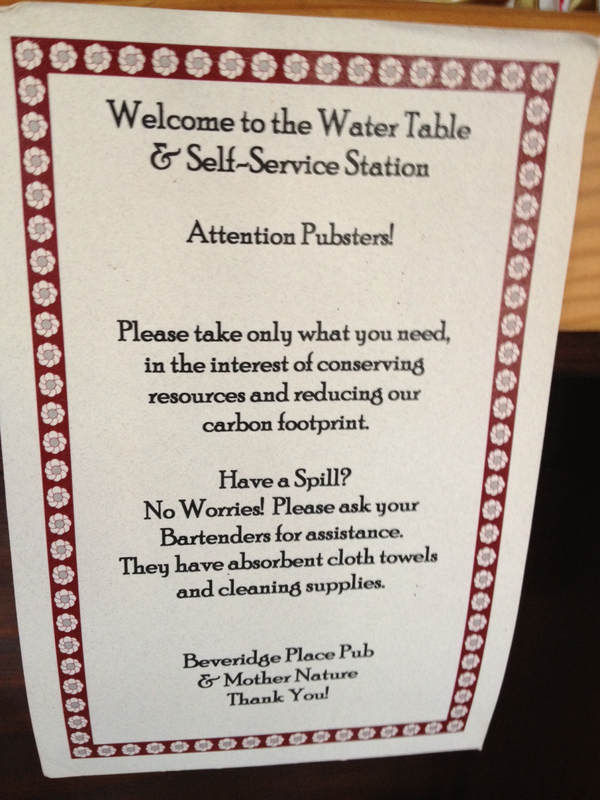 I was struck by the sign near the water cooler that is intended to discourage wasting water. I’m not sure if this is posted in order to try to save the owner money, or if it’s for the environment, but I strongly support not wasting water and believe we as a society waste massive amounts of it every day. Well, how’s that for a climax? Exit Beveridge Place heading left on California Ave. Follow the map for my standard route back into Downtown Seattle. Thanks for joining me on another adventure! I hope you’ll come along on the next one. Change of Plans: Lazy Boy Out, Big Al and Super Deli Mart In. Well it seems I wrote before I fully planned. Once I sat down (at after midnight the night before the adventure) and fully explored the route from downtown Seattle to Lazy Boy Brewing, I discovered several significant gaps in the trail. These would take me out on busy roads and leave this navigationally challenged rider getting semi-lost a few times I’m sure. So since I was only marginally excited to check out Lazy Boy, I opted for a different plan (which wasn’t decided upon until half way through the ferry ride over to the city). My plan instead became to make a trek over to Big Al Brewing in White Center, and to also hit Super Deli Mart over in West Seattle. What? You say. You’re sharing with us your trip to a quickie mart? Oh no, not just any quickie mart. It’s the other one in town that pours craft beer! 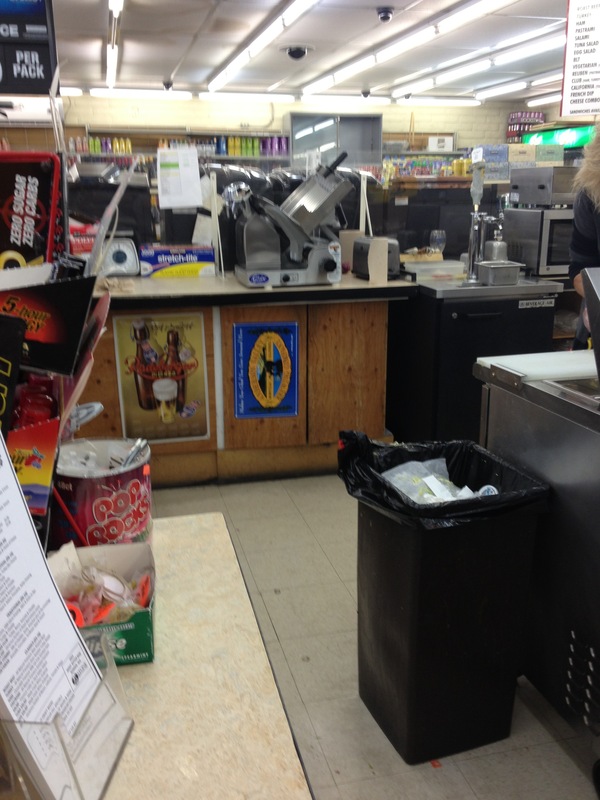 Big Al and Super Deli Mart are two places I’ve enjoyed in the past and have wanted to share with you. It was a good time and I came away with a new appreciation for Big Al Brewing, and an even bigger appreciation of the route there. Look for this adventure soon, complete with map and pics! Just when I thought I’d explored all the trail opportunities Seattle has to offer to aid me in my beer adventuring, I stumbled upon something while checking out a very cool thing: A feature of The New York Times online called “Your Cycling Wisdom in 10 Words.” This is a neat thing that allows cyclists to place markers on a map of their city and tell other cyclists, in ten words or fewer, the significance of that marker. It looks like this service is available for 15 or 16 cities in the U.S., Seattle being one of them. Just so happens I discovered a trail I didn’t know about that runs up to the part of Everett where Lazy Boy Brewing lives. So there it is! My next adventure.